For over 700 years, glass artisans have been performing magic on a little island in a Venetian Lagoon off the shores of northern Italy. The Island of Murano is home to the finest hand formed glass art in the world. What they do is nothing short of magic. They are able to blow very thin and airy forms that are delicately shaped, using only a few simple iron tools. The techniques and tools used by today’s Murano master glassmakers haven’t changed much since the Middle Ages. But while the techniques have remained true to tradition, the designs have evolved into modern day fashion statements. The Murano Magia Collection is the perfect example. This collection not only honors the authentic Murano glass tradition, it celebrates the skill and creativity of the artisan. 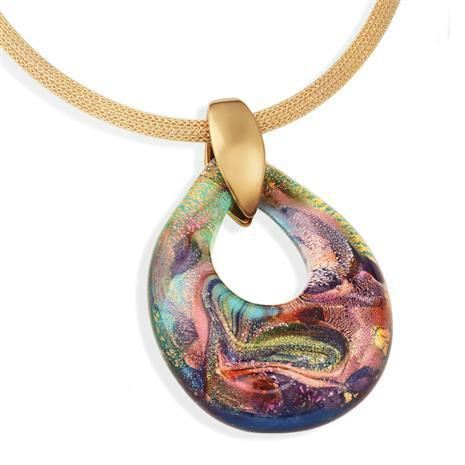 Murano goes chic and modern in a modified teardrop shape that shimmers with iridescent swirls and metallic glints. In terms of the cost, we practiced a little magic of our own. In fact, you’ll find the price downright spellbinding.